Lynn Austin in an amazing author and one I highly recommend you read if you haven’t read her books. Today I will feature my favorite novels by her, some of which I’ve read at least three times! The reason I picked up any of her books was because of this series. I love reading books about the Civil War and this series did not disappoint. So romantic and such an insight into the people of those times. I can’t recommend this series enough! This book was so good they made a Hallmark movie out of it. To me this is a classic Lynn Austin novel because it has alternating points of view, rich history, romance, and mysterious backgrounds. I’ve read it more times than I can count. You’re in for a real treat with this one. One of my favorites! I’ve probably read this one more than the others! It’s got three women’s stories, but one of them really was fantastic. This one is not as romantic as I like, but it was light and so funny. You can’t help but love Alice! I haven’t read this one more than twice, and it’s not so much like the others. That said, it has stayed with me all these years. I disremember if this is the first one in the Hezekiah series, but I sure hope Ms. Austin did her research because to this day not only do I love Hezekiah, I go around telling people, now when the Israelites did A, it was because of B. Her novels will you up and take you many places and her love and relationship with God shines through every book. Anyone else have a favorite of hers? Happy Friday! Oh I was so excited to get my hands on this one and it did not disappoint! I really liked Crockett from The Short-Straw Bride so I was really looking forward to finding out what he had been up to and what would happen next for him. This novel captures you from the very first chapter when the train is held up for the preacher. I found Crockett to be a wonderful hero. He was able to be both a man of God and a man to be reckoned with. I found Joanna to be a very likeable heroine. Her insecurities mixed with her strong faith in God combined to make a real person and perfect for Crockett. One thing that I think Ms. Witemeyer does well is have really good secondary characters. I loved every single one. They somehow manage to be fully developed without taking over the story. They are so interesting, I almost feel like she could write them their own novels. If you want to see the other brothers, they do stop by and it’s lovely to catch up! I loved the message that prayer changes things…even if you have to keep on praying for years. Ms. Witemeyer delivers on another fantastic romance and this one is not to be missed! Lydia Eldredge longs to provide a sanctuary for her son, Nicky. But a constant threat comes from Nicky’s drug-addicted father, who wants the boy and seems willing to do whatever it takes to get him. Dr. Micah Hatcher serves the immigrant population in Queens, but under cover of darkness he provides another service that must not be discovered lest his and his brother’s lives be in danger. When Lydia and Micah’s paths cross, they are suddenly wrapped up in each other’s callings. Through unforeseen twists and turns, they seek a refuge of safety–for Nicky, for themselves, and for the needy people God unexpectedly puts in their lives. When I first picked up this novel I was really excited to see that Ms. Sawyer had jumped into the WWII era. I will say that the first couple of chapters were completely enthralling and pulled me in right away. That said, this novel was a bit slower (or rather more straightforward) than I would have liked and as a history lover made me question a few things. First off, I found Micah to be a bit more of a Beta male than I would have liked. He lacked a certain something to make him exciting. I also found Lydia to be a bit typecast-there was nothing very unique about her. There were quite a few references to her past though, and that made her sound infinitely more interesting than who she was in the present. I did however like the twist that entered the book three quarters in. I wasn’t expecting it and it made sense and worked really nicely in the book. Spiritually, I loved how Micah and Lydia sought the Lord for direction and how they were willing to, not only witness to someone who had caused them grief but help that person as they grew in their knowledge of God. It was a sweet book like its title. For those who are serving or have served in the military, thank you! In specific: my grandfather, my dad, my mom, and my sister! Want to give a shout-out? Feel free! 1. When you started Short-Straw Bride, did you always know Crockett would get his own story? At the beginning, I didn’t have much thought to the secondary characters in the novel. But the more I wrote, the more attached I became to all the Archer brothers. By the time Travis and Meredith’s story was complete, I knew I wanted to write Crockett’s story as well. However, my editors had made it clear to me in the past that they preferred I not write series. So I did some begging and some bargaining. I promised to make his story stand alone with new characters and a new setting so it wouldn’t truly be a series, and my editor agreed. Then, when Short-Straw hit the bestseller list and readers started asking for more Archer brothers’ stories, my editor wrote me and said how thankful she was I had pursued that book with Crockett. I couldn’t have been happier. 2. 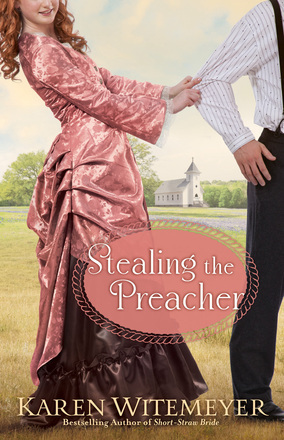 What was your inspiration behind Stealing the Preacher? As I mentioned earlier, the inspiration for Stealing the Preacher sparked during the writing of Short-Straw Bride. Crockett Archer played a key role in the story, his smooth, teasing charm a balance to older brother Travis’s gruff, over-protective nature. I knew in my heart that this man deserved a story of his own. When the Archer brothers were children, growing up alone on their ranch and defending it from those who wanted to take advantage of their youth, Crockett’s niche in the family evolved into that of spiritual mentor and healer. He was in charge of the family devotionals the Archers conducted in lieu of attending a church service, and whenever an injury occurred on the ranch, Crockett was the one to tend it. For years, the Archers never left their land, yet as he grew to manhood, Crockett felt God’s call deepen within him—a call to not only minister to his brothers, but to a congregation of his own. So what kind of heroine could I create for this noble preacher-to-be? Well, she had to be someone who shared his values and his calling to ministry. But if I left it at that, we’d have an awfully dull story. So to liven things up, I made Joanna Robbins the daughter of a retired outlaw, one who despises “sermonizers” and their hypocritical ways. Since Crockett is no ordinary preacher, but a gun-toting rancher with a gift for doctoring . . . well, that meant a plot full of scrapes, trouble, and shenanigans. But amid the adventure and romance lies a heartrending tale of God’s pursuit of a single lost soul. 3. What is the one thing every romance novel should have? By definition, a romance novel needs to have a sigh-inducing love story at its core which includes a happily-ever-after for the hero and heroine. Of course, I also enjoy a lot of action/adventure, humor, and poignant, dramatic moments along the way. 4. You have written a number of books now, do you have a favorite hero or heroine? Or one that stayed with you the longest? People often ask me this, and my answer is always: Asking an author to pick a favorite book of hers is like asking a mother to pick her favorite child. It’s just impossible. However, I know that’s a bit of a cop out, so if pressed I will admit that my favorite hero is probably Levi from To Win Her Heart. From overcoming his violent past, to the extreme efforts he made to hide his speech impediment, to the gentle way he challenged Eden to move from surface Christianity to soul-deep faith – he would get my vote for favorite hero. 5. Can you tell us something about what you’re working on now? When I first saw what this novel was about, I was a bit hesitant. But you shouldn’t be! This is the first novel I have read by Ms. Morrill, and it won’t be my last. I found this book to be a fabulous YA novel. First off, I found Ellie to be a heroine everyone could relate to. For me in particular, when I was younger, I too wrote stories that included people who got on my nerves in high hopes of a kind of passive revenge (I was never published fortunately). So, I understood Ellie on a lot of different levels. Chase and Palmer. I have said it before, and I’ll say it again, I don’t like the two guys and one girl thing. However, it totally worked here. There were a few icky moments (my stomach may have clenched a time or two), but Ms. Morrill managed to iron them out in a way that didn’t leave me frustrated. And of course, it helped that I thought the right guy was chosen in the end, even though I still liked the other guy after it was all said in done (see the dilemma with two guys?). I will say though that I wish high school (and high schoolers) was as interesting in real life as it was in this novel. On a spiritual note, it is a bit flat in the sense that Ellie mentions she’s a Christian and she prays and goes to church, but there isn’t a lot of spiritual growth. However, if this is a series (and I hope it is!) then I think we would see her grow stronger in the Lord. So much fun and thoroughly engaging! Highly recommended! – Girl inherits fortune and instantly becomes depressed. Not reality. – Caring more about others than self. Noble, but not reality. – Lack of violence and blood in a supposedly violent and bloody book. Not reality. – Everyone is nice. Not reality. – Main character never throws a tantrum in face of bad situations. Not reality. There is an author I love, but in her books, her characters are just about perfect. It could be that she is presenting a picture of how Christians should be. But there is something wrong when I can relate more to secular characters than Christian characters. So how can an author garner reality and still have a happy ending? Stay true to the times. Make the men and women, people of their era. It makes a huge difference. If there is an exception, please tell us (the reader) why. Give characters human emotions. Let them be Godly people, but let us also see them work out their human emotions. Make every main character a developed, fully rounded person and they will always be a real character. Anyone else agree? Disagree? Have something to add?